All summer long I’ve been slowly working my way through the Babymouse series. Honestly, I’ve seen students reading these for years, and they’ve always frustrated me a little – I was of the opinion that they were baby books and had nothing of value for 6th graders. Boy, was I wrong. These books are fantastic for 6th graders. They’re loaded with connections to other texts, to movies, to TV shows, to history, and to real life. They’re all about imagination, living your dreams, and being happy with who you are. What could be more appropriate for 12 year olds? There are a few Babymouse books that never seem to be in at my local library – Like #4, Babymouse: Rockstar – would someone please return that already – but this week I just decided to read all the ones they had, even if they weren’t in the right order (order doesn’t really matter with this series). First, I read Babymouse: The Musical, which is the 10th book in the series. As the school drama coach, and a theatre major in college, this one was one of my favorites. Babymouse’s little imaginings took her into some famous musicals. The part I liked best was when she found herself in The Phantom of the Opera, because just last month I was in that famous Opera House in Paris. It’s always fun when the books you read surprisingly connect with things you’ve done in life. 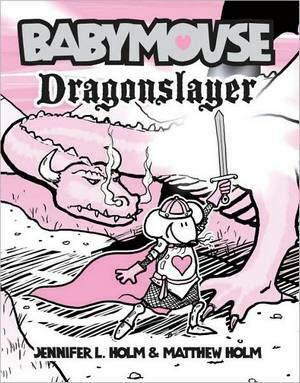 Next was Babymouse: Dragonslayer, the 11th book. This one ties in all sorts of popular stories from fantasy – Harry Potter, The Lord of the Rings, and, in a really fun way that is typical Babymouse, the Narnia stories. This, I think, was my favorite Babymouse so far. I had to skip a few books, but after Dragonslayer, I read Babymouse: Mad Scientist (#14). This one was a clever way to introduce Jennifer and Matt Holm’s other graphic novel series – Squish. In this story, Babymouse is working on a science fair project about amoebas, and happens to find Squish. I’ve already read the first two Squish books, but I imagine kids reading this for the first time, then finding Squish in his own adventures will be pretty excited. The 15th book, A Very Babymouse Christmas, was another fun one. Not as clever as some of the other ones, but still a good book. Finally, I read #9, Puppy Love. 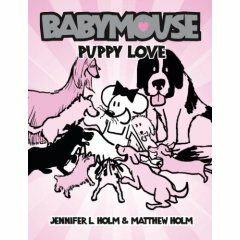 This one is a hilarious look at Babymouse trying to find just the right pet for her. Look for the scene in which we find out what happens to all of the past pets she’s had that have escaped. Typical Babymouse right there. I hope I can get my hands on the few Babymouse stories I haven’t read so far, but I know one thing’s for sure – I will be recommending these to kids in my class this year. I judged these books by their cover early on, but I’ve learned my lesson now. These five Babymouse books were the 77th, 82nd, 85th, 86th, and 89th. I’m reviewing them here a little out of order, but I’m almost done with my quest to read 90 books in 90 days over break.